作者: Eui-mi Seo on 11 August , 2017. 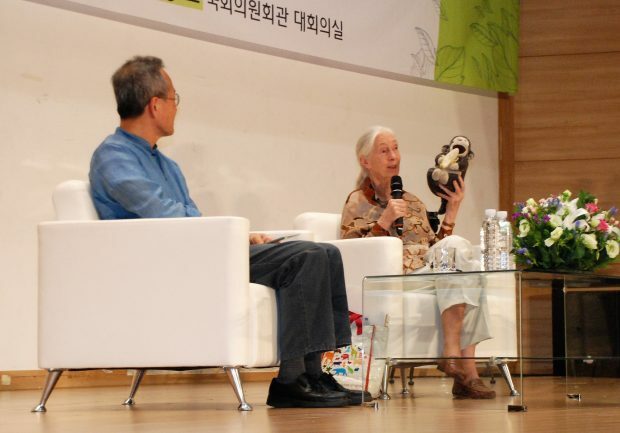 Yesterday, at Seoul Yeouido National Assembly Conference Center, Jane Goodall and her pupil and friend, Choi Jae-chun held a special eco-talk in front of 530 members of the audience that came by joint invitation of the Asia Journalist Association (AJA) and Jeon Hye-sook (National Assembly member). Throughout the program, Goodall and Choi strongly urged everyone the need to protect Mother Nature and all her inhabitants, suggesting the world is running out of time for significant change. 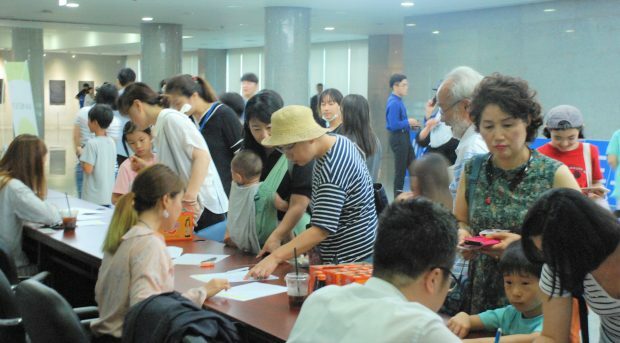 Among those in attendance were young students—children—eager to learn about the ecosystem, environmental specialists, and members of the National Assembly such as Park Ju-seon (Vice Deputy of National Assembly), Jeon Hye-sook (assembly member), and Shin Kyung-min (assembly member). 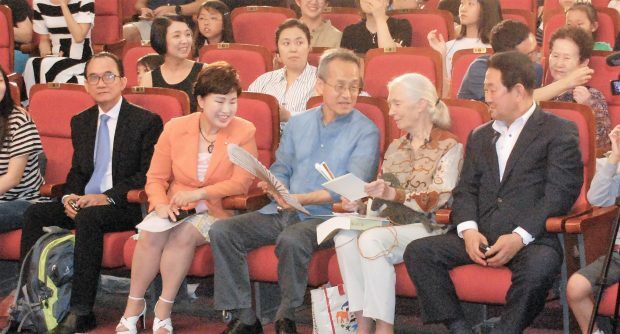 After the introductory speeches had been made by AJA Deputy President Eddy Suprapto and the assembly members, Kim Seo-yeon, a second-grader from Hanyang elementary school welcomed Jane Goodall and Choi Jae-chun to the stage expressing her respect for Goodall’s research in Chimpanzee behavior and emotions. At 83 years of age, Jane Goodall was delighted to meet so many of the young generation, saying that she gets most of her stamina to travel the world from those who are young and passionate about environmental issues. As she became comfortable with the guests, Goodall shared about her past experiences and life mission. For her, it also started when she was a child. In fact, she said that she “popped out of the womb loving animals, and with a loving and supporting mother, [she] was able to achieve her dream of working with chimpanzees”. Having always believed that animals, too, have emotions and are more similar to humans than many realize, Jane was crushed at the devastation modern urban development was inflicting on animals and their habitat. Elephant poaching for tusks that would be sold as pianos and Rhino horns for decorations seemed horrible excuses for killing innocent animals already endangered by disappearing rainforests. And as such, she decided that she had to do something to break barriers that were stopping people from respecting and protecting precious wildlife. To touch on the continent of Asia, Choi Jae-chun asked Goodall of the incredible ecosystem surrounding the Korean DMZ. In response, Goodall acknowledged the border of the two Koreas as a wonderful site of natural habitation almost completely free of human touch. But she continued by mentioning that the world is full of such amazing ecosystems of which many are under threat due to unrestricted human material consumption and energy waste. At this point, Goodall directly addressed the politicians in the room and worldwide, saying that politicians carry the strong responsibility of recognizing global concerns and eradicating national corruption that can be so harmful to the environment. She accused US President Trump for being blatantly ignorant to climate change, but also remained positive at the fact that many nations decided to more actively promote environmental campaigns at the US exit of the Paris Climate Accord.